In this week before Thanksgiving in the United States, I sit back with a cup of caff and get to thinking about all of the things for which I am grateful. I am married to the love of my life and have three great kids. My work is amazingly satisfying, and every month I get to share my thoughts with the Coffee with Kenobi family. It seems to me that gratitude is the basic function of humanity. We are grateful because, let’s face it, on our own we are weak and wanting. But, in a very real way, our gratitude is centered around food. This is a good thing, so bear with me. In my life, we celebrate the Fourth of July with a cookout of tubular meats; in our tradition, Easter is capped off with a feast in the middle of the night. Thanksgiving is a day centered around the table that is shared by many of our loved ones (we hope). In each of these feasts, it is not necessarily about the menu, but the camaraderie and care that each person has for the other. The Skywalker Family is not the typical family, and they have their issues. Now, real families can also be broken. So, while thinking of Thanksgiving, I can’t help but turn to Cloud City. I know, right? Of all the meals depicted in the Star Wars universe, I pick the most dysfunctional one. Let’s go back a few scenes in the movie first. Luke is training on Dagobah, eating protein paste and Yoda brand oatmeal in the mucky swamp. Elsewhere in the galaxy, his sister and other friends are confronting Vader. At this point, no one is aware of the family bonds of the Skywalker family. Man, are they messed up. But Leia, Han, Chewie and the Droids enter the banquet room with the Sith Lord and are treated to, what must be, the most awkward meal ever shared. Ever. Through the Force, Luke feels that there is something wrong, and he has an urge to help his friends out of their danger. This is a negative example of the Thanksgiving dinner table. In fact, the table is bare, the protocol droid has gone to pieces and dad’s about to torture his daughter’s boyfriend. This is not a happy time. But it highlights that our band of heroes are completely thankful for each other. Sure, Han gets frozen for a spell, and Luke’s confrontation with Vader doesn’t go as planned. Chewbacca spends this time carting around spare parts. But they are willing to give up all things for each other’s welfare. This is a great example. And an attitude to be thankful for. To be grateful means to see the inherent value in the other person simply because they exist. How did Luke and Leia instantly form their bond? They didn’t know, though they had a feeling that their destinies were intertwined. Han and Chewie are more than coworkers, but friends who risk everything for each other. Their gratitude for each other is overwhelming. Hanging in my house over our dining room table is a picture of another meal. This one is a revered image of the Thanksgiving table. It is called “Freedom from Want” and it was painted by Norman Rockwell during World War II. As he said, “I paint life as I would like it to be.” Seemingly, the focus is on the roast turkey at the center of the painting. It is an offering, of sorts. The matriarch is presenting the fruits of her labor. The best that she has is put on the table. The patriarch is there ready to serve the meal to his children and grandchildren. Look at the man’s hands. Years of hard labor, perhaps a stint in combat, disfigured them. The family gathered around the table are sharing glances with each other. Years of inside jokes, deep relationships and good times are remembered. Sure, the meal looks delicious, the turkey is at the center of the painting, but the love and thankfulness that radiates is the true subject of Freedom from Want. Our heroes come together in a similar manner after the Battle of Endor. As fireworks are exploding over Naboo and Coruscant, the Rebels and their new Ewok brethren are singing Yub Nub while gathered together in ultimate triumph. They have triumphed over evil and oppression. Freedom has been restored to the galaxy (or so we think, I may have to edit this in 13 months). They can answer Rockwell’s question. They are thankful for each other, and for the passion to restore freedom to all the beings of the galaxy. I firmly believe that it is the very nature of human beings to give thanks. Whether it is for small things, like someone holding a door on the way into a building; or to our spouses and parents for making us who we are. To our Creator who loves us – maybe even more than we love our own selves. In all these things, we must cultivate a life of thankfulness. Happy Thanksgiving everybody! 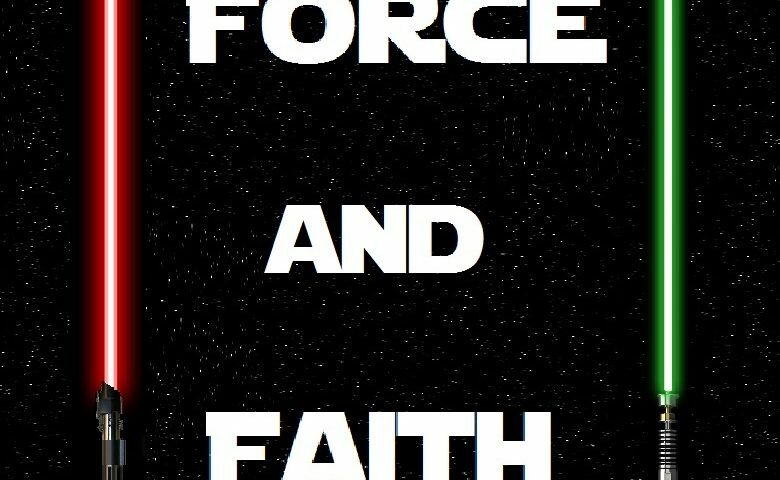 As the Big Four (let’s give Chewie his due) were thankful for each other, so am I thankful for my family, my faith and my new friends in Star Wars fandom. What are you thankful for? How do you show it? Please leave comments on this and all my posts – I really look forward to it. You can find me on Twitter at @adelphotheos and email here at jamesw@CoffeeWithKenobi.com, as long as I am not listening to the latest edition of the Coffee With Kenobi podcast! This is the podcast you are looking for. Next article 'Star Wars: The Force Awakens' Teaser Teased by J.J. Abrams! Yes, I agree, families DO seem to come together around the dinner table 🙂 At least, back in the “Day.” Now it’s only noted during the Holidays…our society has lost track of the simplest of moral notions, like supper time with the family. Not saying it’s everyone or every family, but it IS the majority these days. Which is why, as an adult, Thanksgiving is my favorite holiday. It’s as if … time slows down and my kids are … kids again. You are correct, I believe, that we have allowed the bad parts of the world insinuate themselves (In-Sidisous-ly) into our family. But it doesn’t have to be that way, and if we want to raise healthy kids, families and relationships, we need to maintain those things that are good for us. Even in the middle of the Jundland Wastes, the Lars family sat down to eat together. I lived with a cattle farmer for 2 months one summer, and we shared most meals together. Would you really say it is the majority of families? I believe you, but my demographic is skewed. Often in my line of work, people tell me the right things and not always the actual things. Oh, hey, I forgot. Are you dug out? Do you need any help? I’m down by Ithaca, and we only got 1/2″ the other day. Let me know if you need assistance. I don’t get to spend many holidays with my extended family, but my wife and kids and I always have a great time together – usually happy, unless my little guy asks to play Monopoly. He is 9 and wipes up the floor with us. The holidays are always blessed, at least. Giving thanks is what human beings were built to do. Have a great and joyous feast!